When that provocative question appeared on the cover of Time in August, the accompanying story strained to suggest, on the basis of some anecdotal evidence, that the answer might be yes. The FBI's latest compendium of US hate-crimes data suggests far more plausibly that the answer is no. 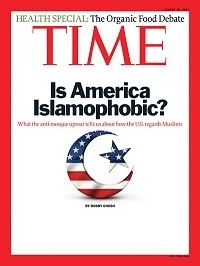 "Where ordinary Americans meet Islam, there is evidence that suspicion and hostility are growing," Time told its readers last summer. "To be a Muslim in America now is to endure slings and arrows against your faith -- not just in the schoolyard and the office but also outside your place of worship and in the public square, where some of the country's most powerful mainstream religious and political leaders unthinkingly (or worse, deliberately) conflate Islam with terrorism and savagery." Time published that article amid the tumult over plans to build a Muslim mosque and cultural center near Ground Zero in New York, and not long after a fringe pastor in Gainesville had announced that he intended to burn copies of the Koran on the anniversary of the 9/11 attacks. The piece noted that a handful of other mosque projects nationwide have run into "bitter opposition," and it cited a Duke University professor's claim that such resistance is "part of a pattern of intolerance" against American Muslims. Yet the story conceded frankly that "there's no sign that violence against Muslims is on the rise" and that "Islamophobia in the US doesn't approach levels seen in other countries." America is many things, but "Islamophobic" plainly isn't one of them. As Time itself acknowledged: "Polls have shown that most Muslims feel safer and freer in the US than anywhere else in the Western world." That sentiment is powerfully buttressed by the FBI's newly-released statistics on hate crime in the United States. In 2009, according to data gathered from more than 14,000 law-enforcement agencies nationwide, there were 1,376 hate crimes motivated by religious bias. Of those, just 9.3 percent -- fewer than 1 in 10 -- were committed against Muslims. By contrast, 70.1 percent were committed against Jews, 6.9 percent were aimed at Catholics or Protestants, and 8.6 percent targeted other religions. Hate crimes driven by anti-Muslim bigotry were outnumbered nearly 8 to 1 by anti-Semitic crimes. Year after year, American Jews are far more likely to be the victims of religious hate crime than members of any other group. That was true even in 2001, by far the worst year for anti-Muslim hate crimes, when 481 were reported -- less than half of the 1,042 anti-Jewish crimes tabulated by the FBI the same year. Does all this mean that America is in reality a hotbed of anti-Semitism? Would Time's cover have been closer to the mark if it had asked: "Is America Judeophobic?" Bassam Tariq and Aman Ali undertook a 13,000-mile road trip, visiting 30 mosques in 30 states for Ramadan. "Ultimately," reported CNN, "they discovered that America still embraces immigrants and the nation is filled with welcoming and loving people." Of course not. Even one hate crime is one too many, but in a nation of 300 million, all of the religious-based hate crimes added together amount to less than a drop in the bucket. I do not minimize the 964 hate crimes perpetrated against Jews last year, or those carried out against Muslims (128), Catholics (55), or Protestants (40). Some of those attacks were especially shocking or destructive; all of them deserve to be punished. But surely the most obvious takeaway from the FBI's statistics is not that anti-religious hate crimes are so frequent in America. It is that they are so rare. In a column a few years back, I wrote that America has been for the Jews "a safe harbor virtually without parallel." It has been much the same for Muslims. Of course there is tension and hostility sometimes. How could there not be, when America is at war with violent jihadists who have done so much harm in the name of Islam? But for American Muslims as for American Jews, the tension and hostility are the exception. America's exemplary tolerance is the rule.